Located in Johnsonville, 1841 is here to bring back some good old kiwi hospitality. 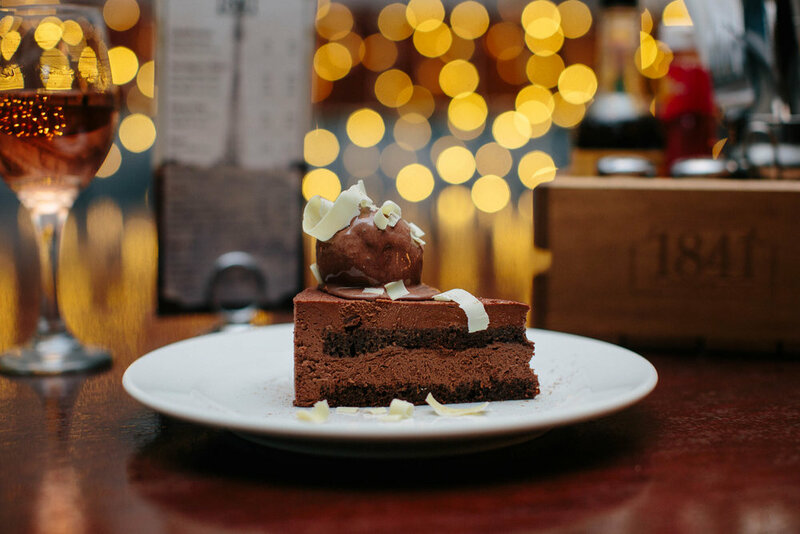 With a hearty menu, a variety of top beverages, weekly entertainment, plenty of live sport & gaming, the owner of 1841 aims to please everyone from the family group through to the hardened sports' fan. At 1841 we are all about the local hospitality. The northern suburbs are where we were raised and schooled, are our home, our work and our community. We look forward to providing the neighbourhood and those visiting with great food and beverages, entertainment and warm professional service, as well as supporting local initiatives and engaging in friendly banter. 1841 – some things never change. Cheese, house-made Napoli sauce & fresh basil, drizzled with olive oil. Half a dozen, served with house-made chipotle aioli. Served with garlic butter, basil pesto, olive oil & balsamic. The Team will gladly inform you of today’s flavour. Served with garlic toast. Served with cheese, bacon, sweet chilli sauce & sour cream. Half a dozen, served with house-made satay sauce & cashew nuts. Lightly coated in cajun spices, served with aioli. Spicy Buffalo wings served with house-made blue cheese sauce. Pulled pork, chilli beef or vegetarian, served with avocado salsa, melted cheese, jalapenos, sweet chilli & sour cream. Blue, Brie & Halloumi served with breads & chutney. Mini spring rolls, samosas, hot dogs, chicken tenders, battered fish & prawn twisters. Served with fries, wedges & dipping sauces. Poached eggs, bacon, sausage, tomato, hash brown & toast. Poached eggs, mushroom, tomato, avocado salsa, hash brown & toast. Fresh fish, lightly battered, served with fries & salad garnish. Pan fried veggies, 1841 slaw & bacon. Topped with a poached egg, beetroot relish & hollandaise. Bacon, lettuce, egg & tomato open sammie. Served with fries. Roasted pumpkin, potato, kumara & onion, served with fresh salad greens, pine nuts, feta & a balsamic reduction. Topped with kumara shavings. Portobello & button mushrooms served on garlic toast, topped with parmesan. Tossed salad greens, cashew nuts & chipotle aioli. Poached eggs, bacon, spinach, hash browns & hollandaise. Served with salad greens, cheese, 1841 burger sauce & fries. Medium-rare porterhouse, salad greens, caramelised onions & béarnaise. Served with fries. Chicken, spinach & cream cheese filo served with house-maderelish & salad garnish. Vegetarian lasagne, served with fresh rocket, house-made Napoli sauce & parmesan. Mildly spiced, with seasonal vegetables & coconut cream. Served with rice & roti. House-made vegetarian pattie, halloumi, beetroot relish & tzatziki. Served with home cut chips. An 1841 favourite! Served with rice & roti. Chicken, bacon & mushrooms tossed in a creamy sauce, topped with parmesan. Served with garlic toast. Chicken, spinach & cream cheese filo served with house-made relish, baby potatoes & 1841 slaw. 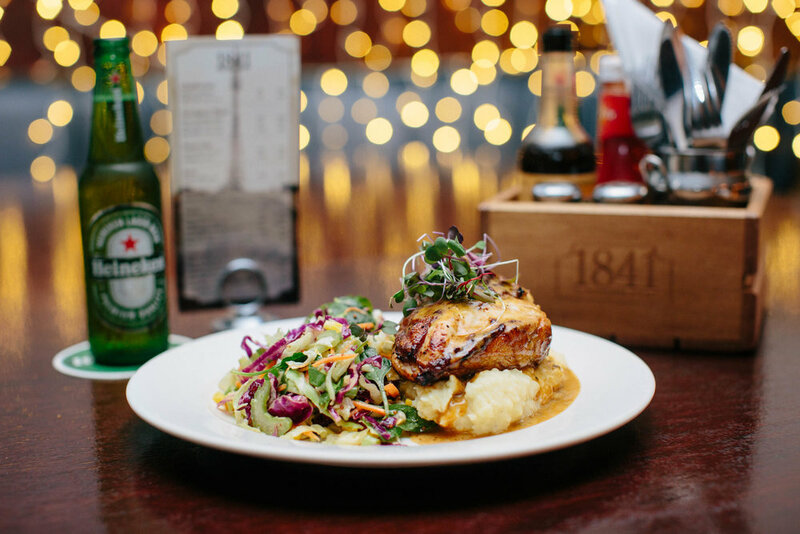 Skin on, char-grilled chicken breast, served with mash, 1841 slaw & a tarragon cream sauce. Medium-rare marinated lamb rump, served on a Greek salad, with kumara shavings, topped with tzatziki. Good old lamb shank taste, without the bones! Slow cooked lamb shank, with carrot, beans, kumara, onion & mint sauce. Served with home cut chips & 1841 slaw. 200g crispy pork belly, served with mash, 1841 slaw, port jus & apple sauce. World Famous in J Vegas! 1kg of pork ribs, slow cooked in our own BBQ sauce. Served with home cut chips & 1841 slaw. Fresh fish, lightly battered, served with home cut chips & 1841 slaw. Honey glazed, served with mash, braised cabbage, hollandaise, basil pesto & kumara shavings. The Team will gladly inform you of today’s fish dish. 200g house-made beef patty, bacon, cheese, beetroot, gherkin, salad greens & 1841 burger sauce. Served with home cut chips. Marinated beef, tossed with fresh salad greens, coriander, mint, sweet chilli & crispy noodles. Dry rubbed, served with mash, braised cabbage & spiced jus. Prime porterhouse, served with home cut chips, 1841 slaw, garlic butter & an egg. 300g scotch fillet, served with a potato cake, spinach, bacon jus, peppercorn butter & beetroot relish. Chocolate, strawberry, caramel or passionfruit. Served with fresh whipped cream & a maraschino cherry. Served warm, with vanilla ice cream, fresh whipped cream & berry coulis. Served with vanilla ice cream & fresh whipped cream. The Team will gladly inform you of today's flavour. Served with vanilla ice cream, fresh whipped cream & berry coulis. The Team will gladly inform you of today’s flavours. Served with house-made almond biscotti. The perfect Mondayitis cure is here! Buy one main meal and get your second main meal of equal or lesser value FREE, from 5pm. Special conditions apply. All main meals $22 + Jugs from $12. 5pm start. Join us to celebrate the end of the week with solo gigs from 7pm. Are you smart enough? Join us for pre-quiz dinner and drinks. Free entry, no bookings needed, WIN bar tabs. 7:30pm start. $1841 loves to support the local community with our fundraiser quiz nights. We have now managed to raise over $526,000! Reservations essential for parties of 6 or more, walk-ins welcomed. We offer FREE venue hire for any function big or small. We have an upstairs bar available with two function spaces – the Top Field, catering for up to 80 and Johnson’s Clearing, catering for up to 40. Both can be combined catering for up to 120. Alternatively we can host your function in the restaurant area downstairs. Upstairs is a fully private area with bar and toilet facilities. 1841 caters for any occasion - birthdays, Xmas parties, engagements, corporate parties, mini conferences or meetings. Personally Customised Space: We can divide the space to accommodate the size and requirements of your function. Johnson’s Clearing is perfect for intimate parties or alternatively utilise the whole space if you have a large number of guests. Adaptable Space: We have a large selection of furniture available for you to use. Our staff will arrange as per your needs to best suit your function. Private Bar: Fully stocked and your choice of how you want to utilise this. You can put on a bar tab, subsidise drinks or your guests can pay for their own. Separate Sound System: With the option to plug in an iPod or play from our extensive easy-listening selection. Large Screen TVs – Ideal for photo boards or slide shows. Extensive Platter Menu: Perfect for large groups of people and suits even the fussiest of guests (pre orders a must). Download a copy here. Buffet Menu: Minimum 40 people for this option. Set Menu: We have a 2 and 3 course set menu available. Conference Options: We can do anything from Morning Tea and Afternoon Tea to providing Lunch and/or Dinner. For more information on how we can cater for your event and availability, please contact us by email - functions@1841.co.nz or by phone - (04) 477 4057. For all email enquiries please include your contact number and any details on the function you are wanting to host! Being a local business with the community in mind, we are inviting local Schools and Community organisations to jump on board with our fun, interactive and hassle free evenings. From something as exciting and fun as a quiz night, you could potentially raise in excess of $2500. We provide FREE venue hire, a FREE quiz package and quiz master. 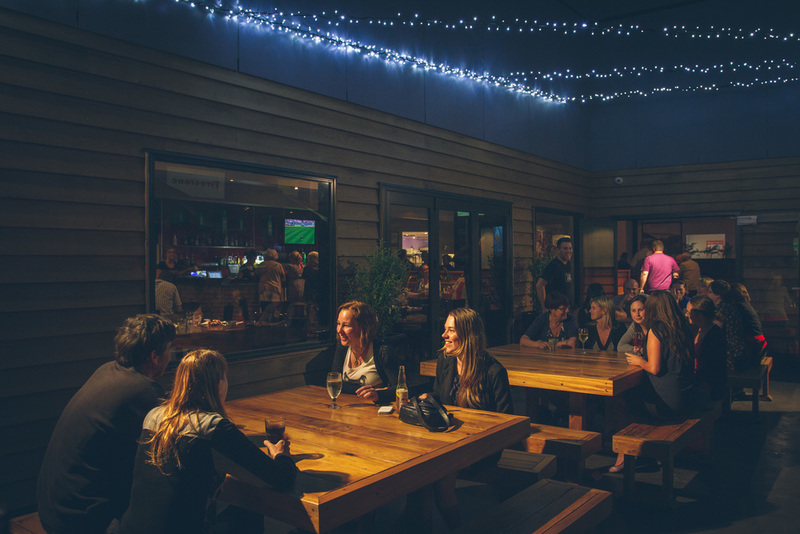 Quiz nights generally work best and have the ability to cater for a larger number of people. If you have any ideas or thoughts for a fundraising evening, we are more than happy to accommodate and make it a successful and enjoyable evening where possible. We can also help to arrange extras like raffles and auctions to increase the funds raised. For more information on fundraising quiz nights, please contact us by email - info@1841.co.nz. Please include your contact number and any details on the fundraiser you are wanting to organise! Download our app - Free on Apple & Andriod - search 1841 in the app store!